The basic premise of the Nature as Teacher (NaT) program is to have students utilize nearby natural habitat to supplement their classroom learning experience and bring it to life within a relevant, real-world context. It involves the use of ecologists, curriculum specialists, and stewards, all assisting teachers to design learning experiences that are in sync with the curricular guidelines of the teachers, their respective school districts, and the Next Generation Science Standards. BackYard Nature Center coordinates all the resources and logistical issues to bring the NaT Program to fruition. The NaT Program can be used to teach any specific subject area or for interdisciplinary learning. No matter what the subject or what the grade level may be, there is an excellent chance the nature can be the vehicle for supplementing classroom learning and bringing it to life. And the learning experience can be a one-hour event such as seeing, studying, and discussing the effects of a fire on a prairie/savannah site, or a nine-month longitudinal study such as the impact of removing buckthorn from an area of 10 square meters. We use three key elements in the process that characterizes the NaT program – collaboration, customization, and coordination. The teachers introduce their learning goals and, with a team of naturalists, collaborate to transform the learning experience using nature as the vehicle. In this process, every effort is made to encourage creativity, problem-solving, and an appreciation for, and understanding of, nature. Working in conjunction with the Village Park Districts or the Forest Preserves of Cook County (FPCC) site stewards, BackYard Nature Center coordinates the activities of the program (with the exception of transportation) to ensure a smooth, efficient, and successful implementation. Learning in nature has been shown to contribute to the development of a broad range of cognitive skills, including observation and focus, critical thinking, analysis, problem-solving, and creativity. It kindles a sense of exploration and discovery, and can build students’ enthusiasm. In the process, students broaden their understanding of nature and reach a deeper appreciation of their natural environment. Using the environment as an integrating context in school curriculum results in wide-ranging, positive effects on student learning… including: development of problem-solving, critical thinking and decision-making skills; increase enthusiasm and engagement in learning. The NaT Program helps you, the teacher, elevate your students’ learning experience and create more engaged students while helping achieve your learning standards. You get access to experts to craft the best activity to meet your goals and make implementation as simple and straightforward as possible. BackYard Nature Center has collaborated with teachers in bringing the benefits of Nature as Teacher to over 60 classes, reaching more than 1000 students. Here are just a few of our success stories. Illinois’ current science standards became effective in February 2014 and are based on the Next Generation Science Standards (NGSS). Forty-one experts, including three Illinois educators, wrote the NGSS. State-level committees in 26 states reviewed the learning benchmarks. These groups confirmed that the design and development of the NGSS were guided by the best available evidence to ensure that students who meet these standards are prepared for postsecondary education and careers in the 21st century. The NGSS can be viewed at 23 Illinois Administrative Code 1 Appendix D.
Classrooms adopting the Next Generation Science Standards are charged with providing students more ‘real world’ problems. 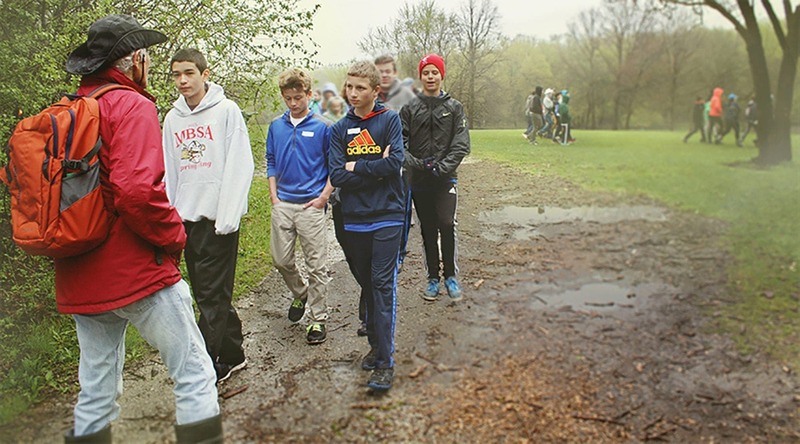 BYNC can help teachers develop unique outdoor learning experiences with help from Illinois Master Naturalists. Students will broaden their understanding and reach a deeper appreciation for their natural environment. Specific academic activities can be developed for each of the following core science curricula.